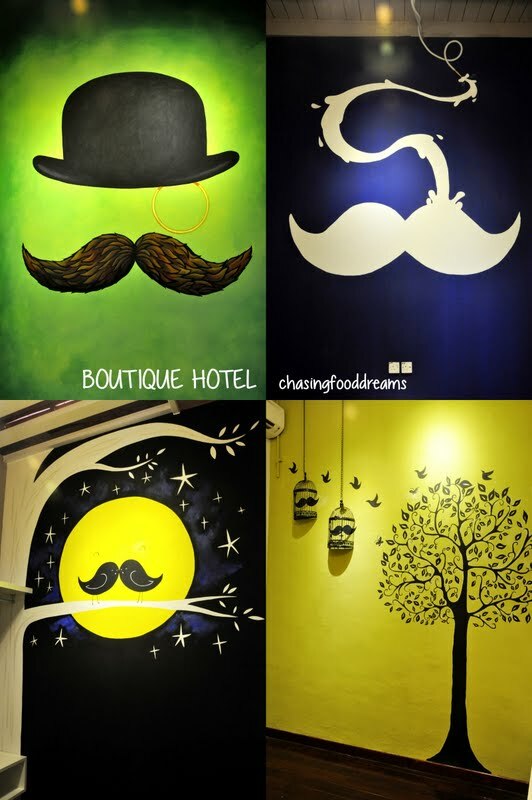 CHASING FOOD DREAMS: Moustache Houze, Campbell Street in Penang: For the Love of a Dream! Moustache Houze, Campbell Street in Penang: For the Love of a Dream! It’s Full of Heart & Soul! It was the love of two ladies that got Moustache Houze started! Over a meal, Christine and Catherine got talking and before any of them could think twice, everything was set and put in place within 3 months. The best friends roped in all help they could get but personally managed every detail. I met them through another friend and was really pleased to be able to check out Moustache Houze on my last trip back to Penang. Located on Campbell Street in Georgetown, Penang, Moustache Houze is set in the old historic area near the famous bustling Chowrasta market. Parking is the only thing I foresee as an issue during mornings since the market attracts a huge crowd. In the late afternoon into evening, there should be plenty of parking available. Moustache Houze is set in a 3-storey linked building gorgeously restored. From the moment I stood outside the place, I saw charm… light grey walls set with white plaster, tiles and gorgeous wooden door, wood framed windows with stained glass and the cheeky house sign. It’s a photo paradise! One will notice a mural of an old man carrying a little boy on his shoulder. I was told that this old man was actually the person whom the owners bought most of their recycled materials from. A light bulb went off and the owners got a local artist Willy Loh to work on this mural of the uncle and one of the owner’s little son. It’s a famous corner and most will stop to take a photo, including me! The café maybe be covered in grey walls but there are plenty of colors to bring the café to life! Both owners put in their creativity and scouted for old materials to be recycled into new. I personally loved their recycled furniture where old steel chairs are covered with light wood and steel tables have old steel panels covered with glass. Another side of the wall features colored sofa chairs set and artistic rendering of metal pipes. The pipes are funky and really cool looking. It even holds books and knick knacks of sorts. Going in, more recycled materials are used while a vintage bicycle is set on a wall painted with the Tree of Life. One of the owners had her sister painted the mural to signify life as it grows and flutter off on its own respective moustache or birds. Love the concept and representation of the Tree of Life. The bar is decked out with bricks, cement and a little wood. The bar centerpiece is the artistic rendition of the pipes again, this time as shelves for the café. Above the bar is a chalk board with the café menu. Bouncing in further, I was caught off by this pretty cozy corner with swings as seats, colored stools and wooden tables. It’s a fantastic touch and I am sure that this spot is gonna be occupied all the time. Since we were there early, we get to camp out at this spot! I got to watch as Catherine was making a Siphon Coffee nearby. Since I am not an ardent coffee fanatic, it’s actually my first time watching this in progress. 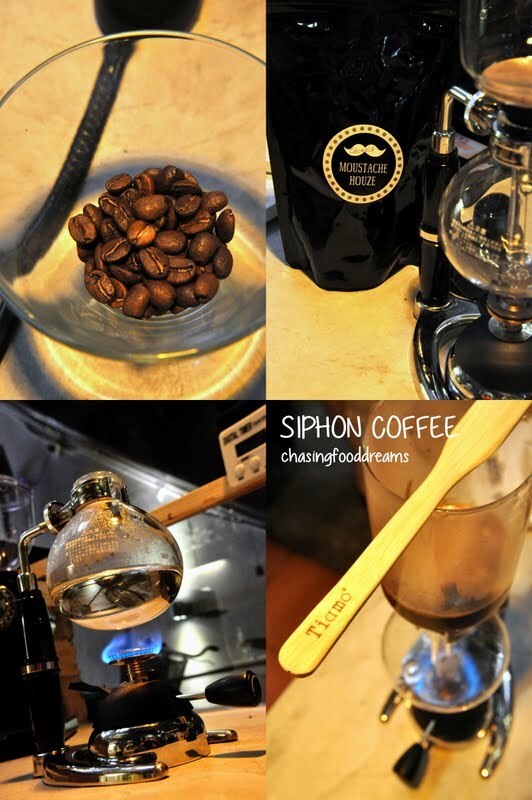 Did a bit of Googling and found out that Siphon coffee is a process of brewing coffee with a vacuum method. 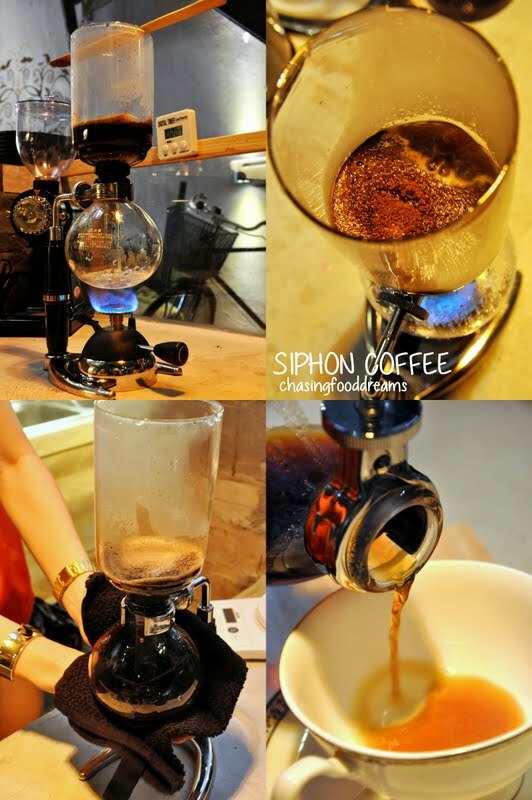 The siphon coffee maker was invented in 1830s. It has two chambers where the vacuum happens. Catherine first freshly grinds the imported coffee beans. Then she pours the aromatic coffee into the top chamber and let it sit over the second chamber where water is boiled over a burner. Once the water boils, the water travels up the top chamber through a long glass funnel. At this point, the coffee is left to steep in the water for a little. The burner will be turned off at this point and as soon as the pressure reduces as the heat reduces, the coffee slowly drips back down to the second lower chamber with a strainer in the funnel. Catherine then carefully removes the second chamber and serves up the coffee. Phew, all these for coffee! It’s definitely serious stuff for a great cup of Joe! The third floor is a space made for just pure hangout. Well one can also rent it for private functions too. It is kept to a minimal and offers lots of spaciousness. Open up the windows anytime of the day and one will get a nice view of the bustling street in daytime or a scenic view of the island at nighttime. Comfy bean bags and cushions are thrown over pallet platform while the other side features a sofa made from pallets. There is also a cute pallet table with wheels too. After seeing all these pallets everywhere in many restaurants recently, I can tell there is going be an increase in the price of the pallets… winks! There is also a lovely graphical poster made from two-piece that shows a moustache that has a few hidden creatures in it. This was also painted by the owner’s sister who did the Tree of Life! The owners take their drinks and desserts seriously to the core! Enjoy lots of beverages from coffee art on coffees, teas and their signature fruit ice with sodas. I love their cute fruit ice cubes with soda for its fruity freshness. We had Pineapple, Strawberry and Kiwi Ice Cubes with Soda, all at RM11.90 each. My favorite has to be pineapple but then again who can resist heart-shaped strawberry ice cubes? Hot Chocolate (RM9.90) for my little one and boy was he excited when he saw this! A first for him as his chocolate comes with a cute mustache with snowy milk foam. I also couldn’t resist and stole a sip. Its got a great dose of cocoa and wasn’t too sweet at all. My partner had Cappuccino (RM9.90) and was thoroughly satisfied with his cup of Joe. Another cute moustache lies on the milk foam and one cannot help but to feel happy seeing this. I just love their mugs and cups printed with the moustache! It’s just such a cute touch and one is seen posing with these mugs. Make sure to sip the foam to create your own milk moustache or you can always borrow the various sizes of wooden moustaches to pose for photos! Though desserts are not made in house, I admired how the owners went literally miles to get these. 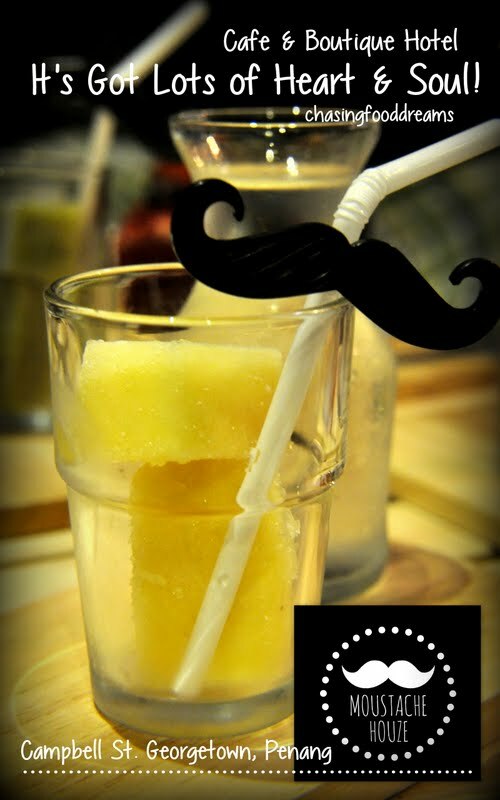 Expressed in from various states, Moustache Houze chooses the best from various famous dessert houses. Focusing on many favorites, check out their selection of desserts that rotates on daily basis. It was tough decision on making a selection of cakes as there were just so many on display that morning. Starting off the lot, a Chocolate Walnut Cake (RM11.90) and a Red Velvet (RM11.90) was served on wooden board. The chocolate cake was dark and rich with bits of walnuts and coated in dark ganache. The Red Velvet tasted decent to me too as it had a nice and fine crumb and the layer of cream cheese icing is just right. Both cakes are not too sweet and this is definitely a plus point. Next up, a lovely assorted Mille Crepe cakes in various flavors all priced at RM10.90 each. We tried Neopolitan, Hazelnut and Oreo Mille Crepe Cakes. Hazelnut takes the cake in flavors for me. Love the nutty creamy taste with chocolate notes. It’s a silky bite that melts in the mouth. The Oreo is pretty good if you are a fan of dark chocolate with icing. There are even pieces of Oreo cookies sandwich in between the crepe and these have gone a bit soft. Neopolitan features Vanilla, Chocolate and Strawberry flavors all at one taste. I heard they have quite a few of other awesome unique flavors too rotated on daily basis. I can’t wait to back and try their Chocolate Mint and Black Forest Crepe Cake! We ended on a high note! Tiramisu (RM11.90) was superb. It’s got its own unique twist on the classic Tiramisu. Fluffy coffee sponge with a thick generous layer of mascarpone cream studded with chocolate chunks and finished with crushed praline. It oozes lots of textures and flavors. From creamy fluffy coffee to airy clouds of cheese and the crunch factor from the praline makes this delicious in every bite. In fact, I believe I polished most of this cake to myself. Moustache Houze has a lot to offer. It’s a fabulous hang out place whether you’re with a big gang of buddies or simply yourself. The whole ambience is charmingly chic with all the pop up colors and the recycled materials. For now, the café offers drinks and desserts but who knows, it has great potential for more. I also can’t wait for the boutique hotel to start operating… it’s gonna be a blast! You took a very very nice photos :D are you a photographer? Cool Cool Cool! Marked this down, a must visit if I travel to Penang!